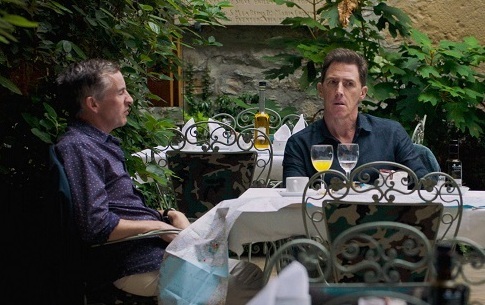 “Let’s do a series of restaurant reviews - this time, a trip to Spain for the New York Times,” Coogan suggests to Brydon and off we go for another round of immaculate meals at posh restaurants, where the dinner conversation consists of dueling celebrity impressions. They have these meals, then retire to their hotel rooms and have phone conversations - Coogan with his agency, son, and girlfriend; Brydon with his wife and an agent claiming he can make him a big star. These suggest conflicts and some sort of plot development but not much comes from them, it’s always back to the impressions. This is frustrating because Coogan has a possibly juicy storyline about a project he’s working on - a follow-up to PHILOMENA, which he starred, co-wrote, and produced – getting green lit, but they want to bring in another writer. Coogan starts off the film on a high from his success with PHILOMENA (something that he brings up often), but there are hints that his star isn’t on the rise anymore, while Brydon, happily married with kids, may be on the verge of a breakthrough but these ideas never go anywhere. Instead we get scenes of these guys dressing up like Don Quixote and Sancho Panza for a photo shoot, and making a stop at the Monastery of San Juan de la Peña in Jaca, Spain, which is fabled to be the resting place of the Holy Grail - something they, of course, riff on.